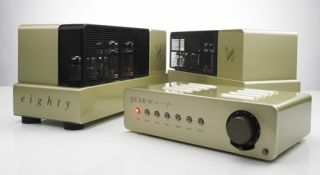 High-end Quad valve amps reviewed – and their designer speaks | What Hi-Fi? We've been enjoying the latest Quad valve preamp and monobloc combination, and now you can read our Quad QC-twenty four and Quad II eighty reviews online. "The classic Quad experience wrapped up with the security of modern engineering," was our verdict, even if some price comparative rivals offer a little more in certain areas. We spoke to to Quad designer, Tim de Paravicini, and asked him to explain what's new in the retro-design electronics, and the thinking behind some of the updates from the classic Quad II. Tim de Paravicini: "The design for the II-eighty pays homage to Peter Walker’s original circuit for the Quad II, but updates it. "Here, the pentode input valves are replaced by twin pairs of triode input valves. They are still in cascode but provide slightly more gain with lower distortion and accurate balance, and run in constant voltage mode with DC feedback. "The Quad II managed 15W output from a pair of KT66 valves. Here, in the II-eighty, we have two pairs of KT88 output valves in dual push-pull configuration for 80W output. "To match this output stage the transformer is manufactured to a strict specification to maintain high-frequency performance and make sure that the full output power is realised at frequencies down to 20Hz. "Finally, the overall feedback is restricted to 16dB expressly to help provide stability into any loudspeaker load, particularly the Quad ESLs."